Discussion in '-off topic-' started by nook, Aug 8, 2006. It might just be my laptop speakers, but is the music mixed really low compared to her vocals? In addition, EMIRU which is the base of LAREINE participates as a comprehensive producer. Emiru’s a great bassist, not sure about producer. Has Emiru produced any Lareine songs? Or is this his first time producing? I’m interested to see how the songs are under his influence. Not any LAREINE songs as far as I know, but he's exclusively done production work since the disband of ANUBIS. He has his own solo project going on at the moment. He owns METAMORPHOSE STUDIO TOKYO as of late (he's even in the picture next to the booking button, how cute!) and from what I can gather, he seems pretty experienced with production. He's produced like ten bands so far (the only other band he's produced that I can recognize [other than ANUBIS] is Majolica). I think he'll do good. From what I've heard of the bands he's produced, his production abilities are solid. Oh my god, what did you just make me listen to?! I didn't make you listen to anything! I think my response was warning enough I don't know what Emiru is smoking, but it's not the kind of stuff that inspires musical genius. but it's not the kind of stuff that inspires musical genius. at least his work with Anubis and Majolica etc. is pretty good. Visual Kei Trashpile likes this. LOOOOOL!!!! AHHAHA What was that? It could be like the recording studio mascot or something, though. I know Starwave Records has Bubu the cat, so maybe Kametan is the mascot of Metamorphose Studio? Maybe it's like a mascot song for the studio? Oy Vey, if it is, they really should fix it up a bit. This is even worse than the time Hora's cats "sang"
It was on one of Kaya's chanson CDs, one of the songs had Kotarou yowling in the background or something XD I don't actually have it around. Cae, Cantavanda and Js_klaus like this. Wasn't it mentioned somewhere that Mayu was also in the audience at the Malice Mizer 25th anniversary live? Or maybe I'm confused because he was mentioned in the MC? I have no idea, but I'm seeing a lot of Malice in Kamijo's eyes and restrained Misery in Mayu's eyes in that picture. MorganIvy and veir_439 like this. What day was he mentioned in the mc? Because everything I have, there is no mention of Mayu. 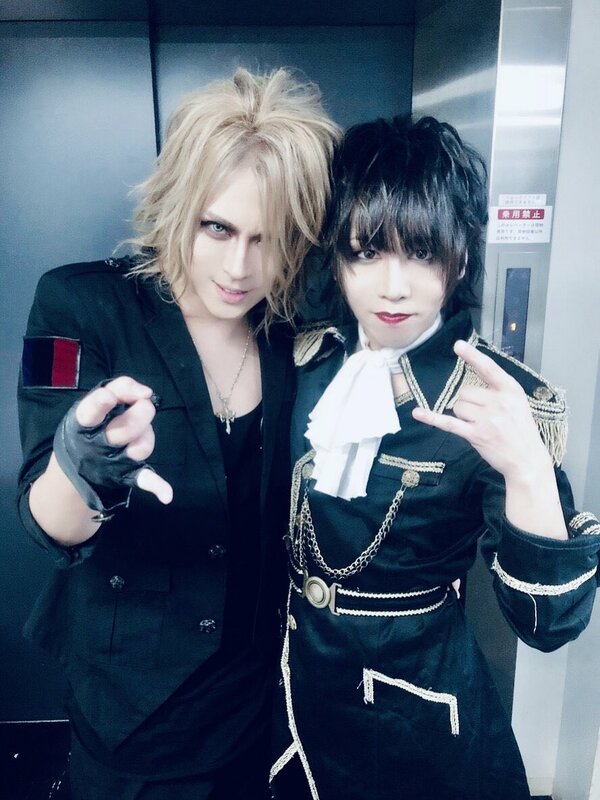 Kamijo talked about dropping Kami's drum head and breaking it, and the second night he talked about trying not to fall on Közi in the car and accidentally kill him. That and saying "bonjour" so many times that even Közi was trying to get him to stop. Weren't there a lot of people (not sure if years ago) who said that many of the LAREINE members were roadies too or something? Not sure if Mayu but apart from Kamijo there was someone else from that band who apparently was a MM roadie. @veir_439 pretty sure all of Lareine were Malice roadies, but again, not sure.